Serious about shedding pounds? Each sign of the zodiac has personality tendencies that make some approaches easier, and thus more likely to succeed. Like all diets, diligence and common sense are needed as you undertake a lifestyle change. The two most important things to maintain on your diet are healthy habits and resolve. Read below to see which might work best for your sun sign. Exercise is the name of the game for you. Even if candy bars are your favorite meal choice, it doesn’t stop you when you’re sights are set on running a marathon. Aries needs to be constantly in motion with plenty of energy to spare, so nobody benefits more from exercise than the zodiac’s Ram. The bull has a conflicting sensibility when it comes to diets. Your love of the sensual pleasures (food!) is countered by a practical understanding of the realities of life. That is why the latest diet trends tend to work so well for you. It’s important that when you immerse yourself in a whole new approach to eating, you have the research to back it up. The greatest thing about being a Gemini is existing in two mental states. Even when you are putting on the pounds, you maintain a self-image of a skinny you and keep that ideal always within reach. When someone born under the sign of the Twin rushes to lose a few pounds before a big date, drastic measures may be taken, such as fasting or intense cleansing. This may have the desired effect, but it’s far healthier to plan ahead and take your time. Nutritional diets that emphasize natural remedies are the ones that work best for the Crab. Juice fasting and raw food approaches help you slim down better than most signs because your nature is to trust the most basic elements, and the building blocks of all nutrition are a great place to start. Lions loves the drama and attention that comes with starting diets and discussing them ad nauseum. Talking about diets is really a way for all of us to talk about ourselves. And so to up the ante, Leos may happily submit to all sorts of medical procedures to have the most dramatic approaches and best stories to tell. Details fascinate the Virgo, so calorie counting and portion control work wonders. 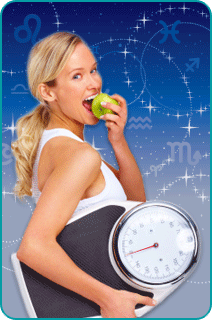 Because no sign of the zodiac likes the minute details of a system like a Virgo, you get better results with a specific, workable weight loss system or a formal program. When your partner also wants to diet with you, the support inspires you to delve into weight loss as a team project. When the scales tilt toward heavy, they can also be tilted back to a happy medium. And yet the optimum weight might never be exactly reached. Libra is the sign that yo-yo diets more than anyone else. It’s all about getting into that one pair of jeans once or twice before the cookie binge begins. A glance of disapproval from your partner (two months and ten pounds later will send the yo-yo back down back down. Nobody diets to excess quite like the ladies of Scorpio. She can withhold pleasure for a goal while simultaneously indulging in all of those bad habits to ward off hunger. Overuse of caffeine and tobacco is a common tactic for this dark and adventurous child of the zodiac. If you find you’re fasting before a weekend of clubbing, at least try to take care of yourself during the week. Sagittarians diet by having fun. You can go out dancing and have a blast and not realize that you just performed an aerobic marathon. You are most successful at losing weight by pursuing a good time. Playing bartender at a party with friends and being the designated driver afterward keeps the pounds off, and while mixing drinks, go ahead and set up a hiking date with the cute guy you met. Developing a system and working toward a set goal with a deadline and final date seems oppressive to some, but to the Capricorn, severe limitations are actually a way to focus clearly on the goal at hand. If you want to run a marathon, look great at a class reunion or aim to be the one they talk about at a friend’s wedding six months from now, you will lose the weight you want. Group activities are your forte. Aquarius is blessed with a love of crowds and people, so a class or other system that involves reporting to other people about how you are fighting the battle of the bulge will reinforce your character strengths and get you down to the size you want to be. When dieting, the Fish likes to get away from it all. A cleanse or weight loss retreat is the perfect place for you to reach your goal. Pacing yourself, establishing rituals and setting routines are what works best. Get away and get started.